A reporter called me the other day to ask for my opinion about the new toys on the market for this holiday season. I’m certainly not an expert on every toy that beckons from store shelves, but I do have some opinions about what makes a good toy. I thought maybe if I talked about some general principles, we could pool our thoughts and information to help each other pick suitable toys from the lot offered this year. I told the reporter that adults often seem to forget what toys are for. Play is the “work” of childhood. While they play, our children are learning new skills, defining themselves as individuals, and practicing relationships with others and with the physical world. When this is also fun, they are learning that learning, being themselves, and sharing are all pleasant experiences. Good toys are toys that help kids do those things. Finally, the toys adults choose to buy tell us as much about those adults as they do about the kids they are buying for. Your values — the things you think are important for your kids to learn about in terms of skills, identity, and relationships — are conveyed in your gift, whether you do it consciously or not. It’s interesting to take a look at the toys you put in the shopping basket as a statement about yourself. There are always new and colorful toys for the choosing. Many do have good play-value. But there are some basic toys that a well-stocked playroom should have to encourage children’s development. My list of a basic dozen for girls and boys from preschool to around age 8 follows. You’ll find that most quality childcare programs, preschools, and kindergartens have all of these toys. If your child spends a good part of the day in such a setting, don’t worry about having everything at home too. If I had to choose only three items from the list for guaranteeing constructive indoor play at home, I’d get the unit blocks, the animals, and the art stuff. Have fun! Unit blocks. Plain wooden blocks (lots of them) in enough sizes to encourage hours of construction, alone and with others. Legos or some other manipulative toy that encourages development of fine motor skills and creativity. Baby dolls and a few basic changes of clothing. Nothing fancy. I’m not crazy about the dolls that crawl, eat, say something, etc. They usually break too easily and they reduce the amount of creativity required to play with them by whatever thing they do. I do suggest having dolls with various skin tones in the playroom. When children love their dolls, they are practicing loving people who look different from themselves. Play kitchen stuff and a play toolbox — both toys for both genders. Kids love to imitate their parents and other adults around them and their play helps them get comfortable with doing lots of different things. Dress-ups — scarves, hats, animal masks, leotards. Look in your closets or in the local Salvation Army store and put together a box full of stuff for hours of creative play. 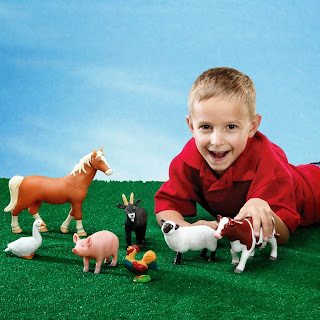 A collection of sturdy rubber or plastic animals (farm animals, zoo animals, and definitely dinosaurs) and a few vehicles scaled to work with the blocks. Your kids will spend hours making farms, zoos, and dramatic scenes. Art stuff. Lots of it. Playdough and cookie cutters, chunky crayons and paper for little kids. Older kids like glue, glitter, safety scissors, and lots of colors of paper. Finger paint. Every kid deserves to be messy once in a while. You might also include an inexpensive plastic tablecloth to put on the floor when it’s finger painting time. Something for making rhythms and music. A pot and a spoon will do for kids under two. Jingle bells for the young child. Something more complicated like a thumb harp for older ones. A sturdy dollhouse with some basic furniture and durable dollhouse dolls that represent everyone in your family. The house needs to be big enough and open enough that the kids can really get in there and play. (Don’t be surprised if you find the dinosaur or the zoo animals in there sometimes.) You don’t have to take out a second mortgage to buy one of those expensive wooden houses. This can be a fun family project. Find a few sturdy boxes for rooms, cut out windows and doors, decorate the walls and put a scrap of fabric down for a rug. Small boxes, jar lids, some fabric and scraps of wood can be easily transformed into furniture. Dolls can be made out of old-fashioned clothespins. Even if you aren’t the creative type, remember that your kids are. Anything that encourages physical exercise: jump ropes, balls, basic sports equipment, skates, age-appropriate riding toys. Too many of our kids lack physical confidence and competence. An age-appropriate board game or two to encourage cooperative play and problem solving. In summary, to foster learning as well as fun . . . Remember that play is the “work” of childhood. Good toys help kids learn new skills and practice relationships with others and their world. Don’t get hung up on gender-specific toys. Little girls and little boys both need to learn to be comfortable with babies and with tools in the world they are going to inhabit as adults.